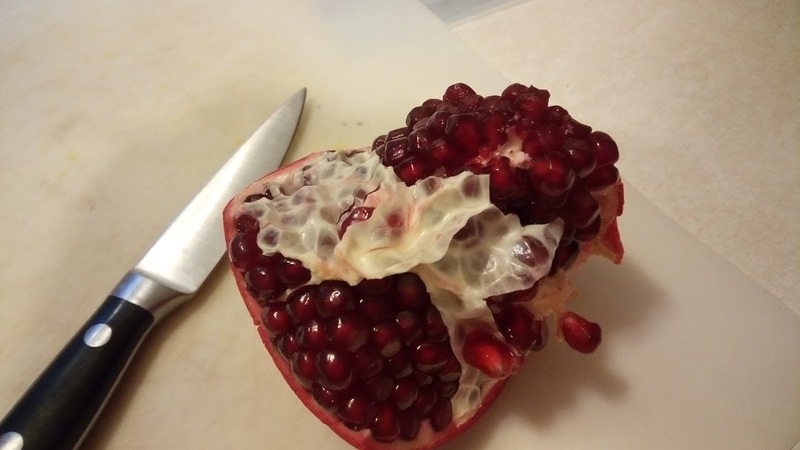 Have you ever peeled a pomegranate? Is that even what it's called? Maybe I should ask: have you ever extracted the seeds (which are actually arils) from a pomegranate? I have. Twice now. The first time? Didn't go so well. Mostly because I did not consult the all-knowing YouTube. The second time went much better. And now I'm wondering why I ever found pomegranates intimidating. I opened this one to include in a yogurt parfait bar last week. So easy! So good! So festive! You should try it! But be sure to consult the YouTube first. And wear dark clothing, because that's the first (and only common) piece of advice that each one of the five videos I watched gave. Apparently the juice is prone to suddenly escaping with velocity, and that stuff stains. 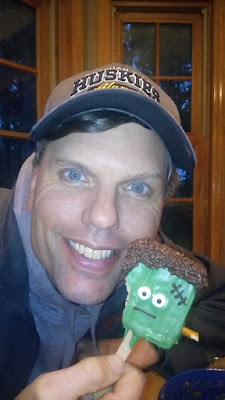 Minor meal plan breakdown occurred this week, partly because Hubby is super busy at work right now, and partly because I forgot about a scheduled date night. Not to worry, friends--I just put those meals right back into the meal plan, although they're not in the "correct" slots. It's OK. The assigned meal types are to help me, so if I have previously scheduled, but uneaten, meals, I can slot them wherever I choose. It's actually a good thing I had to reschedule at least one of the meals, because I ended up not buying one of the ingredients last week--wasn't sure what I was going to do to substitute today. Can you believe how fast December is going? Just a few short weeks until Christmas, friends! I've been making cookies here and there--I even finally made the rest of the Santa's Snickers Surprises that have been in my freezer for almost a year. This week, I think I'm going to try making sugar cookies and decorating them using royal icing. I always just use buttercream icing, because it tastes better, but the royal icing looks so pretty, and I'm not eating the sugar cookies anyway, so why should I care how they taste? And also, Steph says her mission is to rescue the reputation of royal icing. So I guess we'll see how she did. Almond Butter Chocolate Keto Fat Bombs--I finally made the almond butter, so now I'm all set to make these. I'm hoping they taste a heck of a lot better than the last fat bomb recipe I tried. I'm sure I'll make other stuff, too. Just can't think of any of it right now. Last week I told y'all my plan to complete that last pesky 2018 goal, and I just know you are all wondering how its going. Today marks my first deadline, and the first thing I need to tell you is that it was a bad idea to make the deadlines be Fridays. I don't think any other day of the week would have actually been any better, but I do know that Fridays are not good. The second thing I need to tell you is that I met my first deadline. I have made a list of what I want to include. For now. I'm sure that I will want to add more as this project progresses over the next couple of weeks, and through the years. But for now, hooray! The Fidelity checklists are quite comprehensive, so you might want to just start with that. Next up for me: gathering information and figuring out how I want to organize it. See ya next week. Stories behind the Great Traditions of Christmas by Ace Collins contains 26 chapters, each explaining how a Christmas tradition came to be. The traditions are listed in alphabetical order, and include Christmas cards, gifts, lights, poinsettias, and Santa Claus. I enjoyed this book. I like learning about little-known history, and discovering origin stories. The chapters were short and easy to read. The author's style was straightforward, and the book was interesting. The order of the chapters felt a little stiff to me--I would have organized the book by categories or chronologically rather than alphabetically--but overall, this was an interesting, fast read. Normally, I save the carcass from our Thanksgiving turkey to make turkey stock. And by "normally" I mean, "for the last 3 or 4 years". So, in other words, "normal" takes 3 or 4 times to become normal (the moral of the story? Be careful what you do, especially if you don't want it to become normal). Except there was that one year when we weren't at home for Thanksgiving, and I asked the hosts to save the turkey carcass for me, unless, of course, they wanted to use it, and they didn't think I was serious, because who would transport a turkey carcass 500 miles to make stock, and they threw it away. We had to have turkey for Christmas that year, so I could make stock. You probably guessed by my use of the word "normally" that we didn't save the turkey carcass this year. I was all set to throw it away, because we still have a bunch of stock leftover from last year, when Hubby asked if I thought the chickens would like to have a go at it. Sure, I said. Why not? You might be feeling slightly sick to your stomach right now, horrified that I would feed poultry to my poultry. Truthfully, I'm feeling a little sick to my stomach right now (probably not because of turkey eating chickens, though). The whole thing smacks of cannibalism, although I have to point out that cannibals eat the flesh of their own kind, and turkeys and chickens, while related, are not the same kind. The thing is, chickens are omnivores, just like humans. They eat both plants and animals. And generally, the only animals chickens eat are the ones they can catch. Like worms and bugs and the occasional frog. They definitely might have eaten a mole last winter. But if someone is going to offer up some other, already cooked, animal for them to eat, chickens are definitely going to eat it. And so they did. Those chickens devoured the leftover turkey meat on that carcass. Hubby said it reminded him of those bugs they use to clean dinosaur bones. Yeah. I wasn't exactly sure what he was talking about either. But I'm sure it's a thing. The point is, there wasn't much left on those bones. I was thinking about taking a picture to show you, but I thought that would be going too far, that y'all would not want to see that. You probably didn't even want to read about it. Instead, here is a picture of my favorite (and only) lap chicken. Y'all! I almost forgot to write this post! In fact, I had a post all set to go up today (now you'll have to wait until Wednesday to discover the fate of this year's Thanksgiving turkey carcass) before I remembered that there was something more pressing to discuss. I told my phone to remind me on the 4th Thursday of every month to write the 18 for 2018 update post, but this month, the 4th Thursday was not the last Thursday. So my phone reminded me, but the reminder was not quite as relevant as it is in other months. I left the reminder where it was, but it disappeared after a few days. I suppose my phone figured if I hadn't done it yet, I wasn't going to do it, so it was no use keeping that reminder front and center anymore. And even though it was still on my calendar, it was out of (immediate) sight. Which made it out of (immediate) mind. Thankfully, something brought it back to mind, so you do not have to wonder any longer about whether or not I've made any progress on my goals. Well, you do have to wonder just a little longer, because I haven't told you yet. But I will. Any second now. The thing that brought the update post back to mind was completing one of the goals. Yay me! 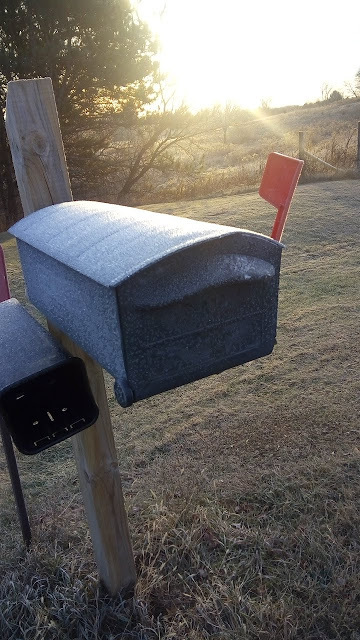 I posted my Christmas cards yesterday. I even managed to write a mini Christmas newsletter (I had to recycle a past writing, but you all have probably forgotten it by now anyway, right?) Cross goal number 18 off the list. The other day, I realized that someone to whom I wasn't planning on sending a card was expecting a Christmas card from us, so I need to tell you this: if you sent us a Christmas card last year, your card went out in yesterday's mail. That's your reward for sticking with us and sending us greetings year after year even when my brain was too ... anxious? depressed? overwhelmed? ... to let me reciprocate. I really appreciate you thinking of us, and we were thinking of you, too. Anyone else, we do have extra cards, so maybe you'll get one, too. Let's see what happens, shall we? We can cross goal number 8 (purging paper) off the list, too, because I decided I was done. I don't remember where I left off, and it's not readily apparent, so I decided not to continue. I stuck the file folder that I picked up off the floor in October back in the file cabinet and called it good. That leaves goal number 9: create a household binder/legacy box. I honestly think that if I meant to make a legacy box, as described by Dave Ramsey, I would have done it by now. I've thought a lot about what I want to include, and in what format, but haven't actually made any steps toward pulling anything together. Let's face it, friends. This is an overwhelming task. This is putting all of the information that someone might need to step into my shoes into one place. Plus all the information one might need to take care of me or my family if I become debilitated. Hubby thinks it needs recipes in it, for george's sake. So he knows where the snickerdoodle recipe is (in his defense, he would need to know that if he wanted to step into my shoes). This is also an incomplete-able task. Even if I do (when I do) manage to get all of the information in one place, the information is going to become outdated. This is what we call a never-ending task. Kind of like laundry. Or dishes. Or, really, any and all housekeeping tasks. I'm going to have to keep going back to update. I should be used to this by now. Yup. It's overwhelming and will never be done. And let's also give myself grace because it will always be a work in progress, so it is ok for it not to be perfect in the first iteration. In fact, it is impossible for this thing to be perfect in its first iteration. By December 7, I will have written down a list of what I want to include, and have an idea of how I want to format it. By December 14, I will have begun gathering information and organizing it. I will also have made a list of any supplies that I need to purchase (that would be page protectors). By December 19, I will have obtained any additional supplies. By December 21, I will give myself permission to call this goal done, regardless of whether I feel like it's really done or not, because it will never *actually* be done. By December 31, I will have informed all relevant parties where to find the binder and what to do with it. Friends, I am gasping to the finish on these goals. But I am going to finish. How are you doing on your 2018 goals? ** Finish valances for master bedroom. I continue to struggle with meal planning. Why is this so hard? For as many years as I've been planning meals, one would think I'd be better at it by now. Ugh. For December, I've adopted a common strategy among meal planners: assign a type of cuisine to each weeknight to guide planning. Sundays will be soup, Mondays sheet pan suppers, tacos on Tuesday, Wednesday will be fend for yourself, casseroles (hot dish for all you Minnesotans) on Thursday, Friday is pizza night, and Saturday we'll grill. The only problem with this, of course, is that my kiddos don't like soup, or sheet pan dinners, or casseroles. Whoops. Oh well. I'm sure they'll be fine. Your turn: if you were to assign meal types to each evening, what meal types would you choose? Here's your weekly menu plan inspiration. Hi friends. 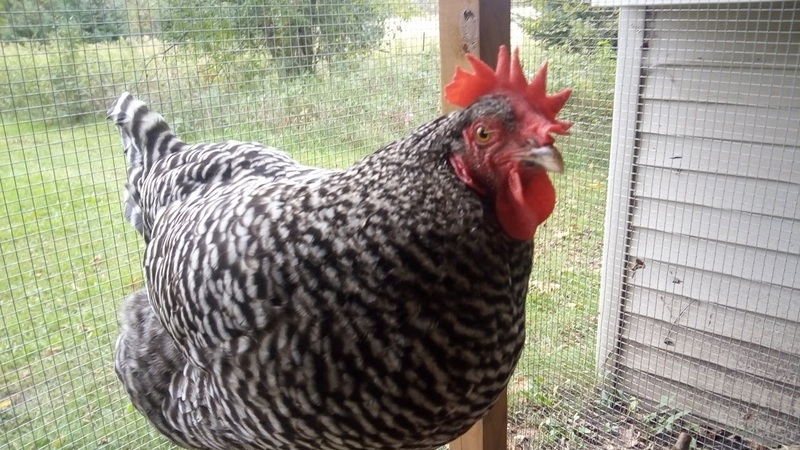 I know you've been waiting for another chicken update, so here ya go. Before we get started, I think it's important for you to know that I've crafted several clever anecdotes to share with you over the past several weeks, but now that I'm actually sitting down to blog, I can't think of a one. So, unfortunately, no cleverness for you today. The Bigs are all in various stages of molt. Rocky has grown most of her feathers back and looks almost normal--we're just waiting on the tail feathers. She might have even laid an egg the other day. I got one that was pale, and definitely wasn't Koko-shaped and didn't look Indigo-shaped, either. On that note, it also didn't look Rocky-shaped, which is why I say she might have laid an egg. Who knows? Esther is mostly done losing feathers and is growing them back. Her itty bitty feathers are so cute! As you can see, she has one tail feather left to lose. Esther definitely did not lay an egg the other day. 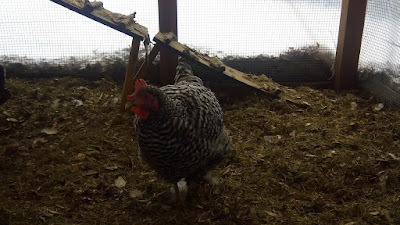 You can't tell by looking at her, but you can tell by looking at the ground in the run and the floor of the hen house--Toasty has entered molt. I'm concerned, because it's closer to the end of November than the beginning, and our temperatures have been well below normal (and less face it--our normal November temps are not that warm), but there's not a whole lot I can do, so I'm just observing for now. One of the things I can do, and have, is switch the girls to a feed with a higher protein content. Feathers are pretty much all protein, so growing feathers requires protein. I've also been giving them high protein snacks, and I've been sharing a little bacon and beef fat with them from time to time. It's not good to give them a whole lot, because their little digestive systems can't handle a lot, but since fat is harder to metabolize, it also makes the chickens warmer (humans, too. If you're too cold, eat fat). Ah Hazel. She's such a puff-ball. When it's cold out and she fluffs up her feathers to keep warm, she looks like a turkey. Hazel hasn't been laying very many eggs lately. I'm hoping it's just the cold and the lack of light affecting production, rather than something more heinous. Koko. She's so smart. 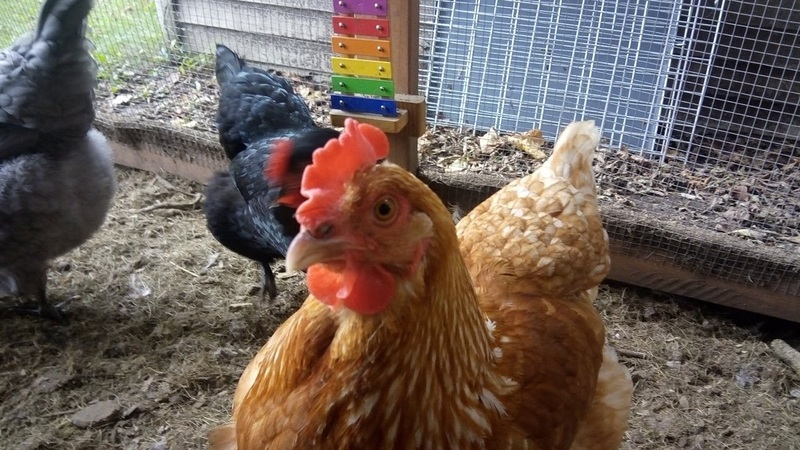 Koko's at the bottom of the pecking order, so she's gotten really good at getting food and water when the others are less likely to go after her. Like, for instance, when I'm distracting the others by standing at the door. And here's Indigo, standing on the roost on one leg. It was colder that day, so she was keeping her other foot warm. Koko and Indigo are the only chickens who are laying eggs right now. Usually we get just one egg a day, which is definitely not enough to keep up with consumption, especially since Bubby has decided he likes eggs now, and AKD is currently in residence--we could very easily go through more than a dozen eggs a day (and I look forward to being able to do that when production increases in the spring). I actually had to buy eggs the other day, and I'm thinking I should have gotten more (yes, I do know that if we add a light and/or heat to the coop we will get more eggs, but I tend to agree with Lisa, of Fresh Eggs Daily, that the girls deserve a break in the winter, so no light or heat for us). 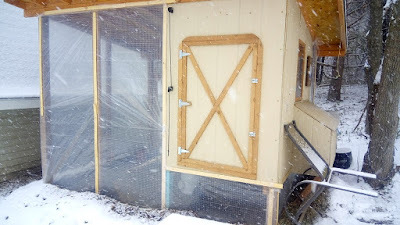 I am really glad that we got the plastic put up on the outside of the coop a couple of weekends ago. It was so warm that weekend (like, mid to high 40s) that I felt kind of silly putting it up, but then it snowed days later, and the run stayed nice and dry. We lined most of the coop, not necessarily to keep the chickens warm, although the clear plastic does create a slightly warmer micro-climate on sunny days, but mostly to keep the snow out. It provides a nice wind break for the girls, too. 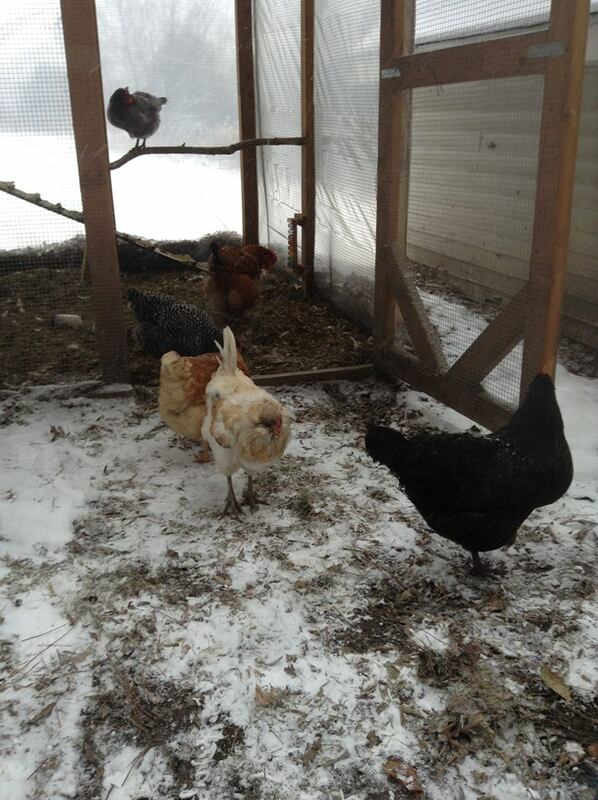 The chickens are not really fans of snow. This was their first time out in snow for the season and they were back in within 5 to 10 minutes. 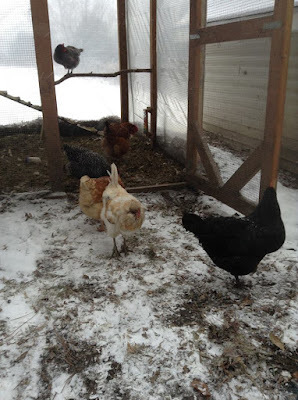 I've been letting the girls out for about an hour each day before sunset, which is great when the ground isn't frozen, but when it is, there isn't much in the way of fresh vegetation or bugs to find. The girls do still enjoy getting out for a bit, though, and I enjoy not having to worry about them being carried away by hawks, because most hawks migrate. Cream Legbar. They lay blue eggs, y'all. Blue! And they have a feathered crest! California White or Austra White. I was planning on getting a CW this spring, but we bumped her for Hazel. CWs and AWs are white with black polka dots! And we need a white egg layer. Maran. Marans lay dark chocolate brown eggs. And they have feathered legs! 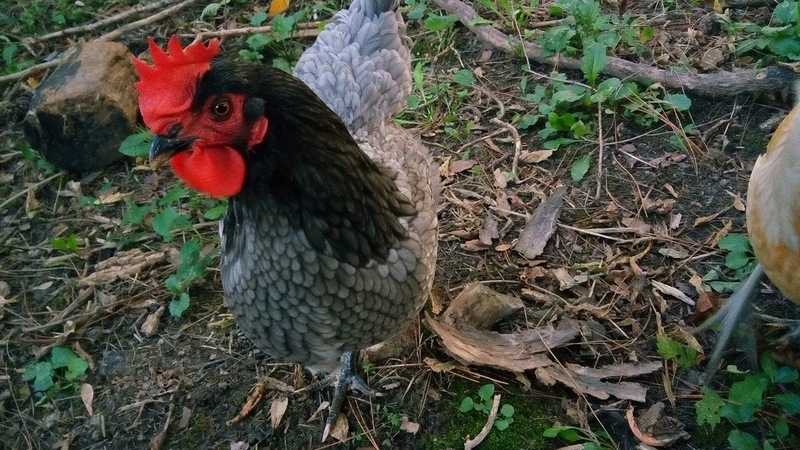 Blue Laced Red Wyandotte. These birds are just so pretty. 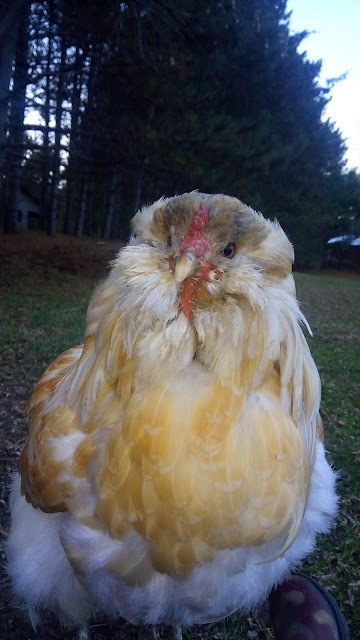 And Bubby thinks we need some Silkies. 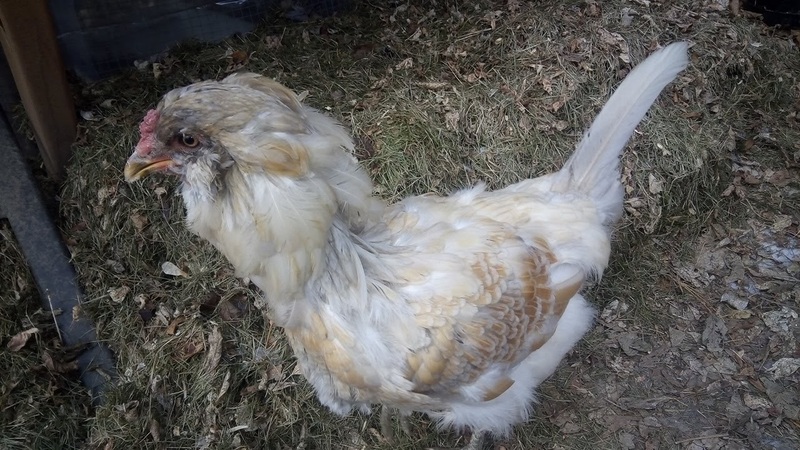 Silkies are just so fluffy! And they have black skin and blue earlobes! And y'all! They have five toes! They're not very good egg layers, but they are so darn cute! I have a problem, y'all. Hi friends. It's a big food week, y'all. Thanksgiving. Looking forward to spending our day with family, football, Frisbee, and fantastic food. I recently read Less Than Perfect: Broken Men and Women of the Bible and What We Can Learn from Them by Ann Spangler. What can the Bible's most flawed men and women reveal about who God is and how he reaches out to less-than-perfect people? Bestselling author Ann Spangler takes us beyond cardboard cutouts of 38 biblical characters to reveal real people with many of the same dreams, temptations, and weaknesses we have. Whether considering the murderous Herodias, the scheming Jacob, or the doubting Sarah, Spangler approaches both familiar and lesser-known characters with fresh eyes, bringing them to life for modern readers by including key cultural and historical insights. As you learn more about the people who are part of your spiritual family tree, you'll discover why God loves to use imperfect people to tell his perfect story of redemption. Designed for individual reading or small group study. Each of the thirty chapters in the book begins with a Bible verse or two, followed by a retelling of the story in the author's words. Next, there is a section called "The Times," in which the author conveys a bit of historical context to the story, followed by "The Takeaway," in which the author poses a few questions suitable for reflection or discussion. I appreciated the historical context provided by each "The Times" section. I think modern Christ followers miss so much as we read scripture because we don't understand the cultural norms of the times. I found the reflection questions in "The Takeaway" to be thought-provoking, and useful in finding a way to apply lessons from the story to modern life. At the same time, I found it very difficult to get into this book. I was expecting something along the lines of Liz Curtis Higgs' Bad Girls of the Bible, and this is not that. When the introduction said that the relevant stories would be told in the author's own words, I expected modern retellings, but that wasn't what I got. I was also annoyed by the fact that the first two chapters were about Adam...and Eve... using the same story. It felt redundant and, frankly, I was bored. I think that first story, repeated, along with my erroneous expectations, ruined the book for me. There is goodness to be found in the pages of this book, but I wasn't able to appreciate it. And that's my fault, not the author's. Hi friends. We finished last week on track after a slight derailment midweek due to Hubby's last minute business trip. That's a good thing. But I'm also a little sad about it because that meant I had to come up with all new ideas for this week. Well, I suppose I could have repeated, but I don't think the kiddos would be too happy about that. I realized something after AKD left home for college this fall. I realized I needed to start freezing meats and other freezer meals in smaller quantities. I mean, I realized ahead of time that I would have to do that, but I didn't realize how early I would have to start doing it. We have had months of extra hamburgers (because I would freeze them in quantities of five), and pork chops (also frozen in quantities of five), and chicken, and steak, and stew meat. And now, he's coming back. So the hamburgers, and pork chops, and steak, and chicken, and stew meat are frozen (solid) in too small quantities. Anyway, AKD will be home for a week surrounding Thanksgiving, and some of his favorites will be back on the menu this week and next. I've missed him. I realized, last week, that it's possible my youngest kiddo, who is now 11 years old, has never eaten lasagna. Someone mentioned lasagna to him, and he was like, what is that?! I think by the time Bubby came along, our oldest had already discovered his aversion to cheese, and due to that aversion, somewhere along the line I stopped making lasagna. What kind of parent am I, that my kids' lasagna education has to come from the streets? I just don't know anymore. In the grand scheme of things, perhaps it isn't important. But lasagna is one of those things that everyone experiences at some point. Well, everyone except for my kiddo. It's something that defines us as Americans. Sort of. I mean, have you ever heard of someone not even knowing what the stuff is? Anyway, of course my kid's lack of lasagna education has caused me to second guess just about everything. What else haven't exposed my kids to? What else have I inadvertently missed telling them about? Yeah, so...lasagna is not on the menu this week. But other things are. Hi friends. It's the last Friday in October, so it's time for another 18 for 2018 update. As you know, encouraged by Gretchen and Liz from the Happier podcast, I made 18 goals for myself to accomplish in 2018. I have accomplished 15 of my 18 goals, and have made progress on two of the remaining goals. I've thought a lot about the third of those remaining goals, too. Yeah. You're right. I haven't done a darn thing in October, either. Well, I did look at the filing cabinet. And I picked up a hanging file folder that was on the ground and put the papers that had fallen out of it back in to it. And I did think about addressing those Christmas cards. And I listened to the deep dive Gretchen and Liz took into the "Facts of Life" book, and I almost started writing down categories for my household binder. I don't know, friends. Is it the thought that counts? I've lost momentum, friends. An object in motion tends to stay in motion, unless acted upon by an outside force. I have been acted upon by an outside force that's mostly inside my head. And now I'm an object at rest, that is tending to stay at rest, until acted upon by an outside force. I've lost momentum, but I haven't lost heart. I follow the #18for2018 hashtag on Instagram, which means that anytime anyone posts publicly using that hashtag, it shows up in my feed. None of the posts that have shown up in my feed have shown 15 or more goals completed. In fact, I think the most I've seen was 9. Nine completed goals, of 18. Most have completed far fewer. I am so far ahead. Or I'm right on track: 18 goals divided by 12 months times 2 months left equals 3 goals. How are you doing on your goals for this year? 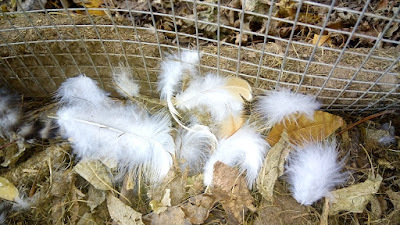 Here is a random Esther-feather photo. Yeah. It's sad. But Bubby is done with football for sure after this week, and MC is likely done after this week, and then we can resume normal eating around here. Thank God the kiddos get a good-ish lunch every day at school. In other news, Rocky's silhouette is startlingly chick-like these days. She no longer has a tail, and her wings have greatly diminished in size. I can finally tell that she's lost some feathers (I can tell that she's growing feathers, too. Cute little pinfeathers everywhere). The good news is the tail is generally the last part of a molting chicken to lose its feathers, so perhaps she is close to done. For a couple of days every time she groomed a feather it would come out, and every time she shook, multiple feathers would fly off. That hasn't been happening for a few days: further evidence, perhaps, that she is coming to the end of her molt. I sure hope so. 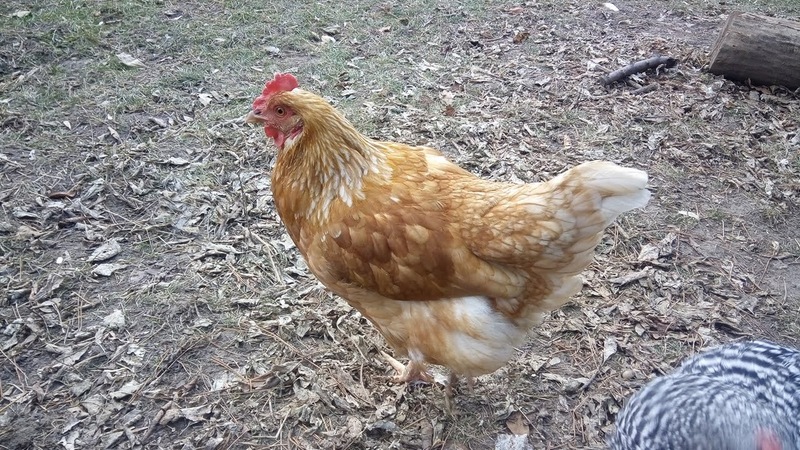 Rocky hasn't been as naked as she could have been, but it's getting cold (cold being defined, at this time of year, in the context of molting, as below freezing) at night. I've seen no further evidence of Toasty or Esther molting. Perhaps they are being sensible and waiting until it's warmer. Or perhaps they've read the chicken raising books that say chickens molt when they're 18 months old, which for them will be in November. Yikes. In other news, I received a clear message of God's loving care for all of God's people the other day. I'm not going to attempt to explain. I'm just going to say that it is amazing to me how God puts so many separate and unrelated events into motion to make His plans advance. Made my scalp tingle. There's nothing that Guy can't do. Except stop loving us. Y'all, I surrender. Football season has defeated me, and I can no longer maintain the facade. There will be no more menu planning until football season is over. We have plenty of food; no one's going to starve. It's ok. And it's only 2 more weeks. I think. Not sure how long the coaches are going to keep the sophomores practicing (and that's not really the team that makes menu planning execution difficult anyway). So sorry to disappoint my loyal menu plan readers. Here's some inspiration for you. In other news, I'm engaged in Molt-Watch 2018. 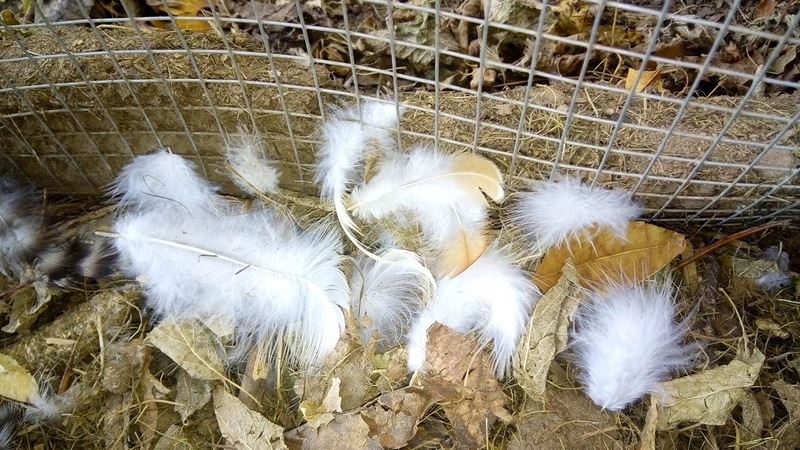 Molting is the process whereby birds lose their feathers and grow new ones. For some reason, chickens do this in the fall. When it's getting cold. Instead of when it's 100°F and losing feathers taking off one's feather coat makes sense. 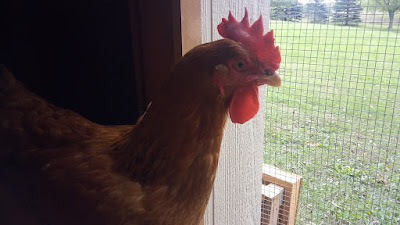 We didn't experience molt last year because it only happens to chickens who are more than a year old. Toasty Crunch seems to be the least affected by molting. I've seen a few of her feathers on the ground, but no more, really, than normal. She's decreased egg production, but we've still seen nine eggs from her in the past two weeks. Esther, as I've mentioned, lost some feathers around her chin--her lovely, fluffy beard has been naked for a while, but I haven't noticed her losing feathers from anywhere else. 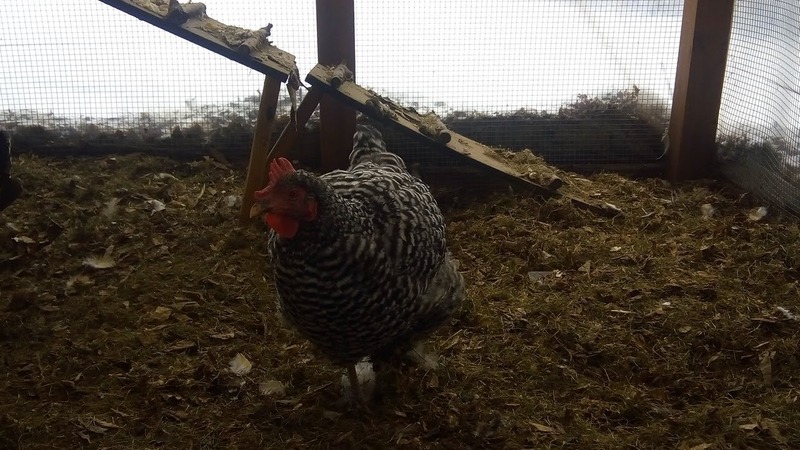 Esther has laid four eggs in the past two weeks. On the other hand, Rocky has given us zero eggs in the past two weeks, and there are Rocky feathers everywhere. The ground seriously looks like she's been tussling with something fierce, and losing. But I honestly can't tell by looking at her that she's lost any feathers. Rocky's also been spending more time off by herself, which I guess is normal. Growing new feathers can be painful and exhausting, or so I've been told. I've been giving the girls a little extra protein to help them along, but there's really not much else I can do for them. I just hope they've got full coats before the cold really hits full force. I'll keep you posted. See? No starving around here. Y'all. 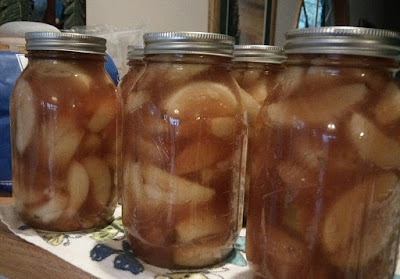 We preserved apples this weekend. So many apples. As I mentioned, we decided to make some apple treats besides applesauce this year. 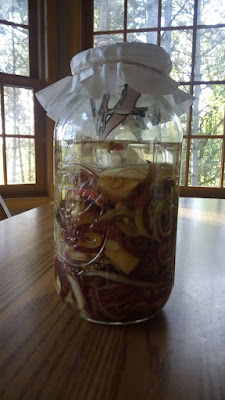 and I started a batch of apple cider vinegar with the scraps. Why yes, I am using a pteranondon jelly glass as a fermentation weight in my apple cider vinegar. 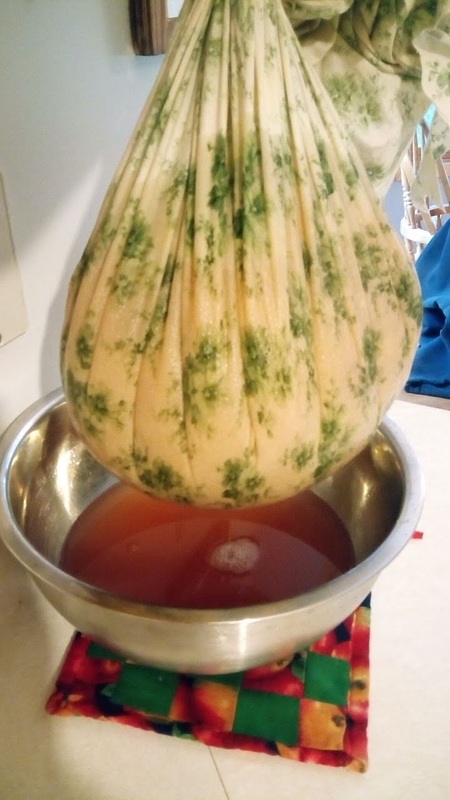 The next day, I thought I was making apple cider, but it turns out I was actually extracting pectin. Whoops. 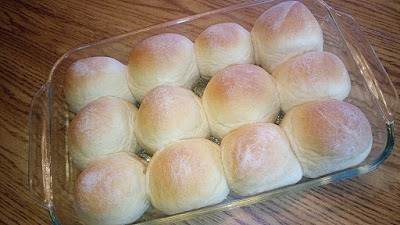 I guess that's what I get for listening to random strangers on the internet rather than using a tested, trusted recipe. This apple cider looks suspiciously like applesauce. Oh wait. I'm a random stranger on the internet. For some of you, anyway. Don't listen if I try to tell you how to make apple cider, kay? Improvised jelly bag. I wasn't ever going to finish that quilt anyway. So, yeah. 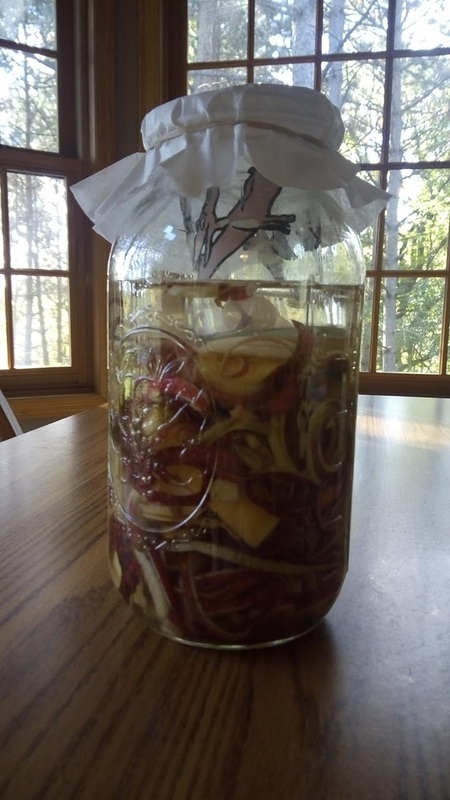 I've got about a gallon of apple pectin. Or apple juice concentrate? It's slippery. And does not taste like apples. But at least it's a pretty color. 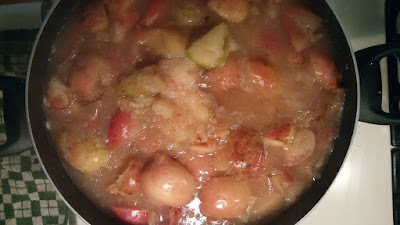 Next, we started in on the applesauce. We ended day two with 25 pints. We decided to do mostly pints this year because they're a better size for giving away as gifts. Applesauce. It felt like waaay more than this. 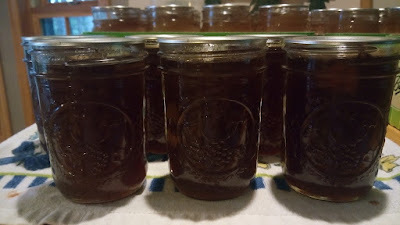 Day three, I made a batch of apple pie filling. I had been planning on using a random stranger's recipe, because it sounded good, but after the apple cider pectin debacle, I reverted back to a recipe given to me by a friend a couple of years ago (recipe below--I don't know if you can trust me on this or not--it's one of those handed down recipes that has been used for years, but it's not necessarily approved by the USDA). Apple Pie Filling. So pretty. Then we made another 6 quarts, 10 pints, and one half pint of applesauce, for a grand total of 10.375 gallons of applesauce, to round out this years' apple preserving. We are done. But y'all. We made all that with the apples from just one of our two apple trees. I might grab some off the other tree to make muffins or apple crisp, but we're going to #feedthewildlife with most of the rest of the apples. The deer, turkeys, bears, and chickens will thank us. Peel. core, and chop the apples. I used our apple peeler to peel, then our apple slicer/corer to core and slice. Fill seven quart sized canning jars with apple chunks, just up to the neck. In a large saucepan, stir together sugar, clear jel, cinnamon, nutmeg, and salt. Add water and stir. On medium high heat, cook and stir until the mixture boils and thickens (this took a lot longer than I was expecting, but be patient--it'll happen). Add hot syrup to apple-filled jars, using a bubble popper or the handle of a wooden spoon to help the syrup move down and fill all the air pockets. Leave 1 inch headspace, making sure all the apples are covered in syrup. Process in water bath canner for 20 minutes. One quart will fill a 9" pie. Bake according to recipe instructions. Apple Pie Filling also makes a delicious Apple Crisp. Just follow your favorite recipe for the topping. Apple Pie Filling can be used to top ice cream or other desserts. If you have extra syrup, you can use it to top ice cream or pancakes. Hi friends. It's just as well I didn't get a menu plan post up last week, because the plan broke down on day one. That's why I've just given up on Mondays. Fend for yourself, it is, until football season is over. It's the last Friday in September ... (where did that come from?) ... which means it's time for another 18 for 2018 update. So ... here goes ... are you ready for this? In September, I ... did nothing ... toward my goals. Well, I did shred some of the previously purged paper related to goal #8, but I feel like that doesn't really count. And I listened to Happier podcast 185, wherein Gretchen and Liz encouraged listeners to make a "Facts of Life" book, which is what I need to do for my goal #9. I am now busy waiting for them to do a "Deep Dive" into the Facts of Life book, so I can get more ideas about what to include. The last remaining goal, sending Christmas cards in 2018, remains in stand-by mode. Click here to see the entire list. I honestly thought I'd make more progress in September, considering the kiddos went back to school. Turns out I underestimated the emotional impact of this years' back to school experience. No worries. I still have three more months to accomplish three more goals. Well. Since that's done, what else should I tell you? How about a garden and chicken update? Yes? OK! The weather has finally turned cooler, which means the garden is pretty much done. There are a few more tomatoes still out there, and I'm planning on bringing them in, along with the jalapenos, this afternoon. I also need to dig up the rest of the potatoes, and figure out what to do about the garlic. I don't think the garlic is done, so I'm considering leaving it out over the winter. Apparently, planting garlic in the fall and leaving it out over the winter is a thing, even in our northern planting zone. Our apples are ripe, and quite a few of them have fallen, to be gobbled up by visiting deer. 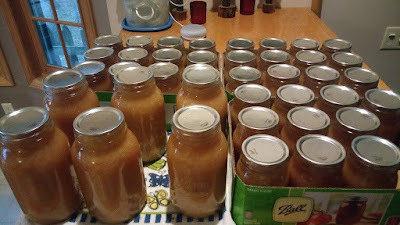 I'm not too upset about that, since we still have a lot of applesauce left from last year. With one of our main applesauce eaters out of the house, we just don't eat as much of it. We're planning to do some applesauce, mostly in pint jars, since those are a more practical size for gift-giving, but we're also going to make some other apple products, like apple cider, apple pie filling, and caramel apple jam. In chicken news, I noticed the other day that I could see Esther's chin--the same chin that's always been covered by fluffy feathers. She hasn't been laying eggs; she's losing feathers. Sounds like molting to me. 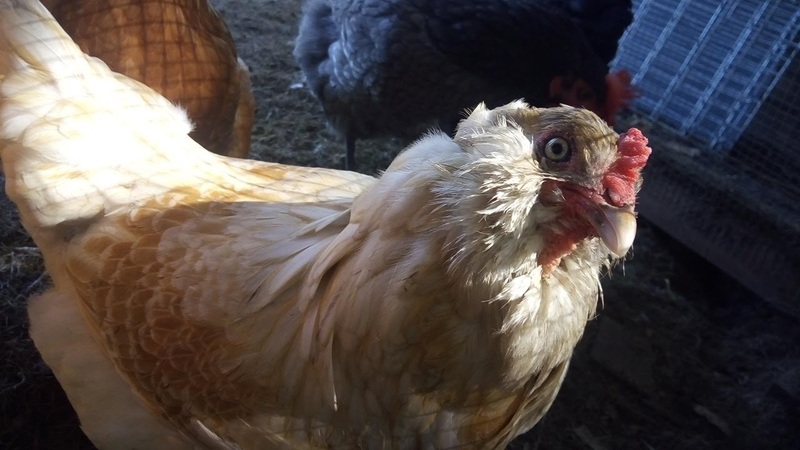 I do not understand why a chicken would want to replace her feathers just as it's getting cold. I hope it goes quickly enough that she stays warm. 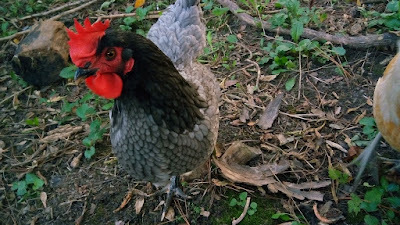 Rocky also hasn't been laying eggs, but I haven't noticed any missing or new feathers on her. Toasty has slowed down, but is still laying pretty regularly. Esther. Her chin is less fluffy these days. Rocky. Maybe she is missing some feathers on her face. That might explain why she's looking more wrinkly these days. Toasty Crunch. Our flock's matriarch. Who persists in behaving like a rooster. The Littles are making up for their older sisters' shortcomings in the egg laying department. Indigo and Koko have become very reliable layers, giving us an egg each just about every day. Hazel is pretty reliable, too, if not quite as prolific. 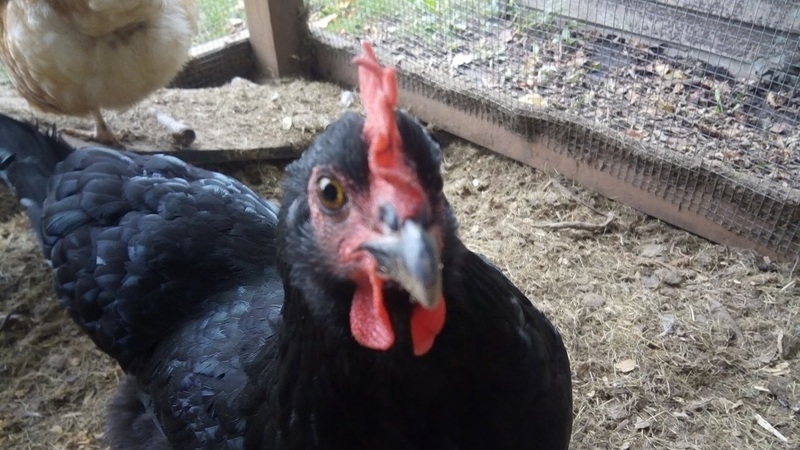 Koko, my would-be lap chicken. You guys! Menu plan breakdown did not occur until Wednesday last week. Whoohoo! But when it happened, the breakdown was spectacular. We finally got back on track yesterday. This week, like last week, I suspect breakdown will occur in 12 hours or less, but maybe I'll be surprised and we'll be able to hold out longer. Only 5ish more weeks of football season. Then I won't have as good an excuse for not cooking and the consequential menu plan breakdown. Menu plan breakdown isn't all bad. Sometimes, it can be a good thing. That's because I don't have to think of as many meals--I can just move the unmade, but shopped-for meals to subsequent weeks. And yes, I am hopelessly optimistic sometimes, thank you. I also need to tell you that the French onion chicken skillet was really yummy. I liked it a lot. MC said it was ok and he'd be willing to eat it again, Bubby tolerated it (but made toast at the earliest opportunity). That's about as good as it gets around here.